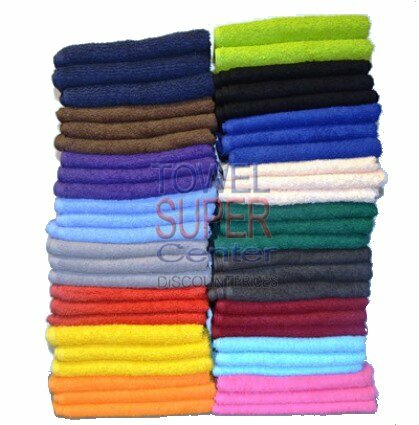 Hand towels wholesale Colors in size 15x25-(2.4Lb) for car washes. Super soft and highly absorbent hand towels for absorbing and cleaing in large variety of colors. Every car wash needs to find a balance between the best tools for the job and the most attractive ones. You don't want to walk into a car wash and see ripped, unattractive towels lying around. You wouldn't want those towels anywhere near your car, and neither would your customers. When you run a car wash, you must invest in good-looking towels that will also hold up over the long haul, performing job after job with minimal tearing. That's why Towel Super Center's premium hand towels offer a great investment for your business. Available in a range of colors, they can get even the toughest job done, staying in one piece and still looking nice enough to leave around the car wash. Your customers will get a kick out of their bright hues, too, which you can choose to match the color scheme of your business. As a business owner, you undoubtedly rank quality among your biggest concerns when you buy materials for your company. It's important to show your customers you are willing to invest in their comfort and that you will shoulder whatever expense you need to get the job done right. Softness: You need towels that can clean and wipe down customers' cars gently to avoid scratching. Our pliable towels deliver that touch. Versatility: You may need our towels to apply chemical treatments to cars or to wipe off water. Whatever you enlist them for, they can withstand the challenge. Quality: These well-made towels won't bleed when they get wet, and they will stand up to countless washes, a key attribute for car wash towels since you do so many loads of laundry. Business owners want the best product for the best value. Our premium hand towels certainly fit that description. They are priced low to start, and the cost goes down the more you purchase. When you buy in bulk from us, you can reduce the price you pay per dozen. You probably go through hundreds of towels each week at your business, so why not stock up? It will save you money in the long run because you can lower the price you pay for them. You also save the time and hassle of having to order more later. Great pricing and great products — that's what you get when you order from Towel Super Center. We have many long-term customers who continue to come back to us because we sell the best towels available for car washes. Our discounted prices and unique colors also draw in car wash owners. Get your new towels delivered right to you when you buy from us. Contact us today for more information or to get a quote on pricing for your bulk order.